It has been a very long winter and as a result I haven’t been able to get outside to run too much over the last few months. So with that in mind I was looking for a spring race to get me ready for the upcoming season and as a tune up for the Pittsburgh Marathon next month (May 3rd). 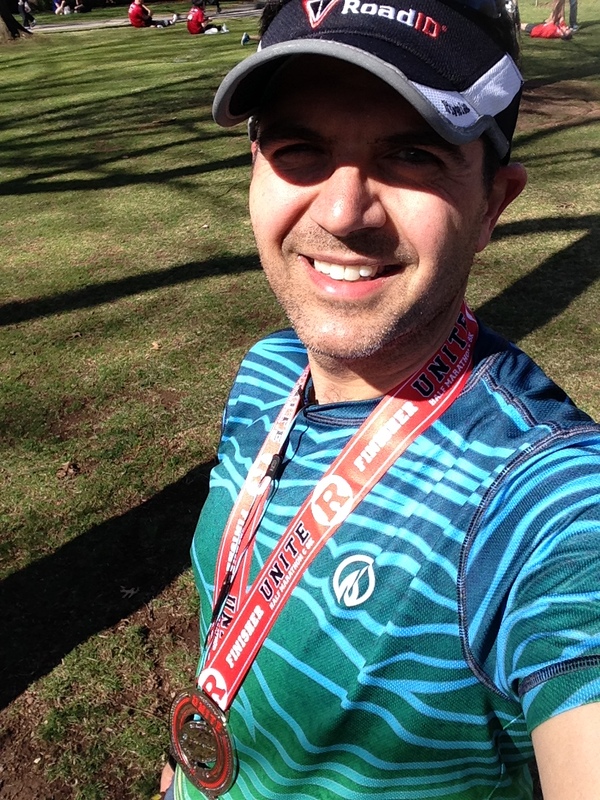 I had a choice of running the Bucks County Half Marathon in Tyler Park which I have run 3 times already or try for something new. 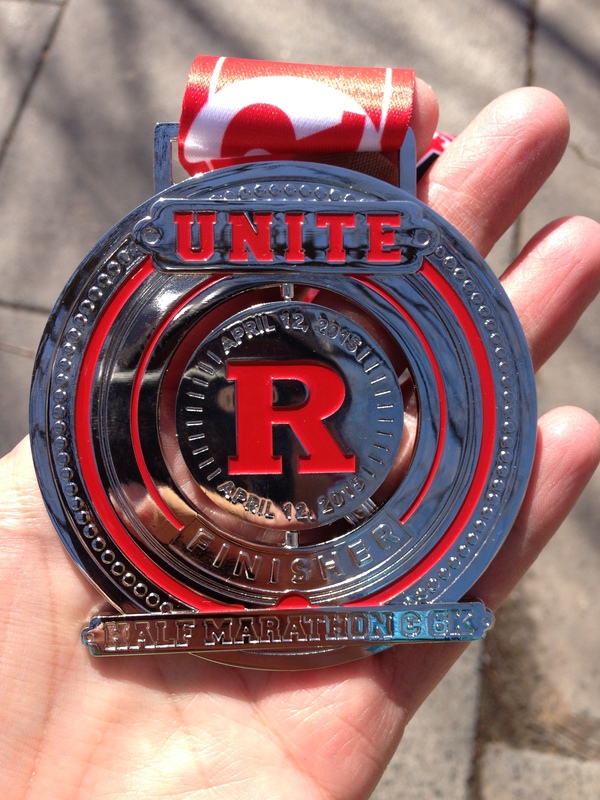 As I listen to my friend John’s ‘The Runner Of A Certain Age‘ podcast (as well as being a guest now and again) I decided based upon his review from the prior year to sign up for the Rutgers UNITE Half Marathon. 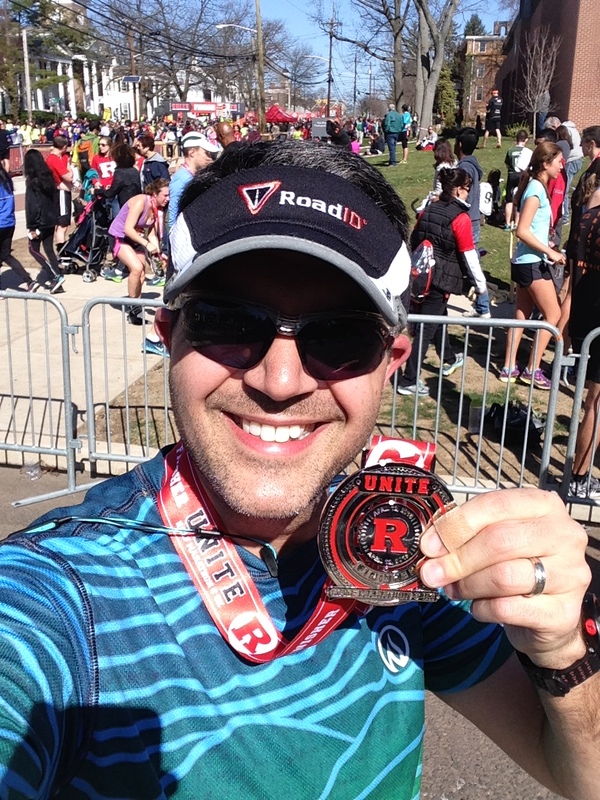 The Rutgers UNITE Half Marathon is put on by the CGI Racing team and they are responsible for other races such as the LOVE Run Half Marathon which I ran last year and also the New Jersey State Triathlon which I signed up for this year (my first triathlon) and I’ve had a good experience with this organization in the past. So, before we start, I have to confess that I messed up a little with the planning. 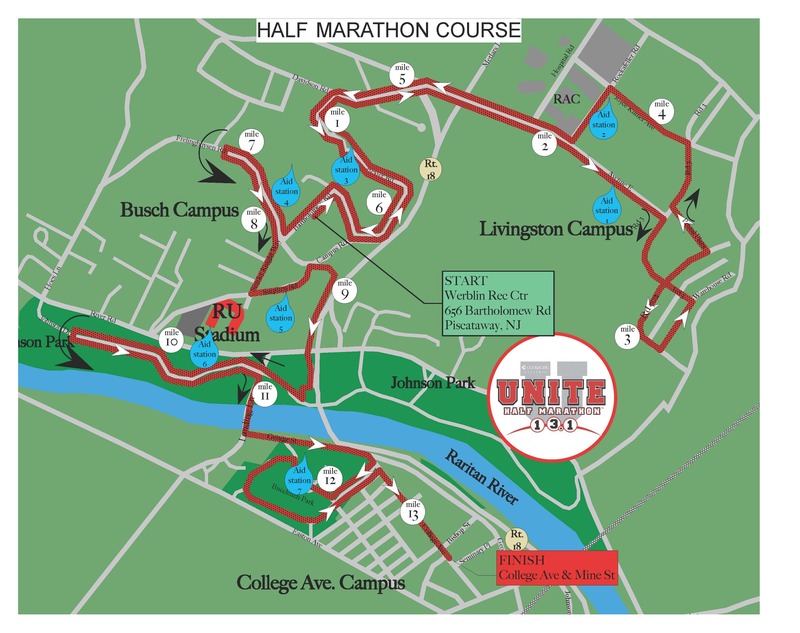 I know that locally Rutgers has a campus in Camden, NJ which is not too far away and is an area where I have run races before (Benjamin Franklin Bridge 10K) and we live not to far away from Rider University. For some reason in my mind I thought I would be running locally. Not so much. 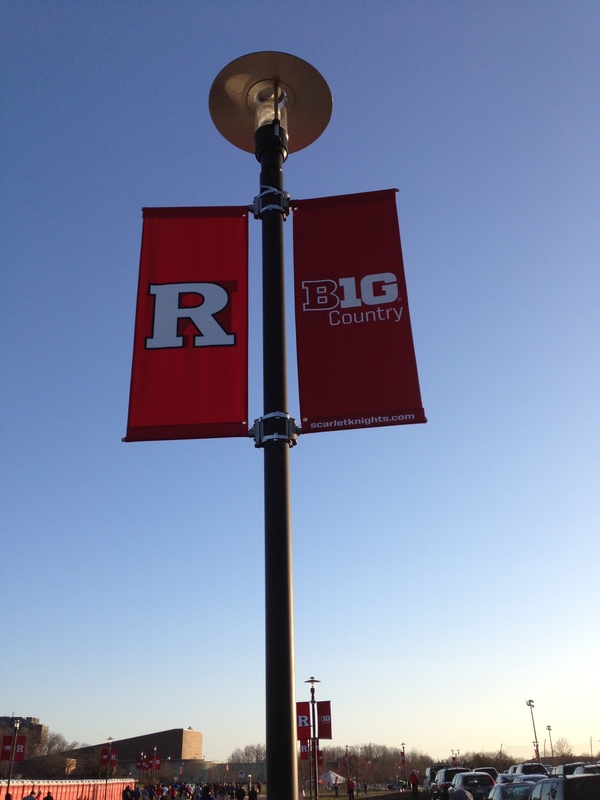 The main Rutgers University Campus is up in Piscataway, NJ which is over 45 miles away and a good hours drive. Hmmm…. Once I figured out that I realized my mistake in not signing up for race day packet pickup. 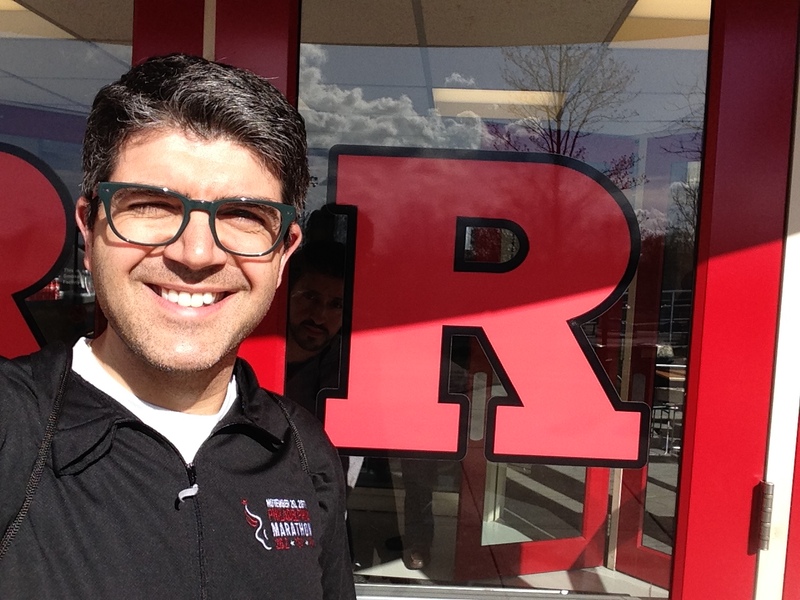 I had to travel up to Piscataway the day before and on the day of the race. 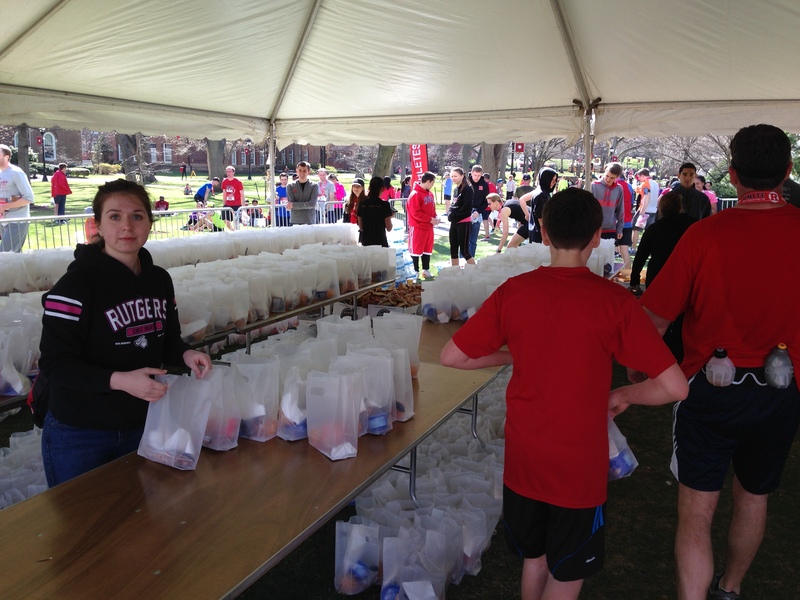 I probably spent more on gas and tolls than the cost of the race day packet pickup. Now before you think I’m completely crazy my experience of race day packet pick up is fine if I was to run a 5K or 10K but I don’t want to feel rushed before a half or a full marathon. In fact, based upon my experience with the LOVE Run marathon from CGI the year before it was a big race and I didn’t fancy the idea of fighting the crowds. Also, the race guide talked about parking at the starting area or the finish area and shuttling to and from. I didn’t want to deal with that on top of this all. On the day before the race I got up early to be at the race expo as it opened so I could get back home and not be too disruptive to our planned family activities. 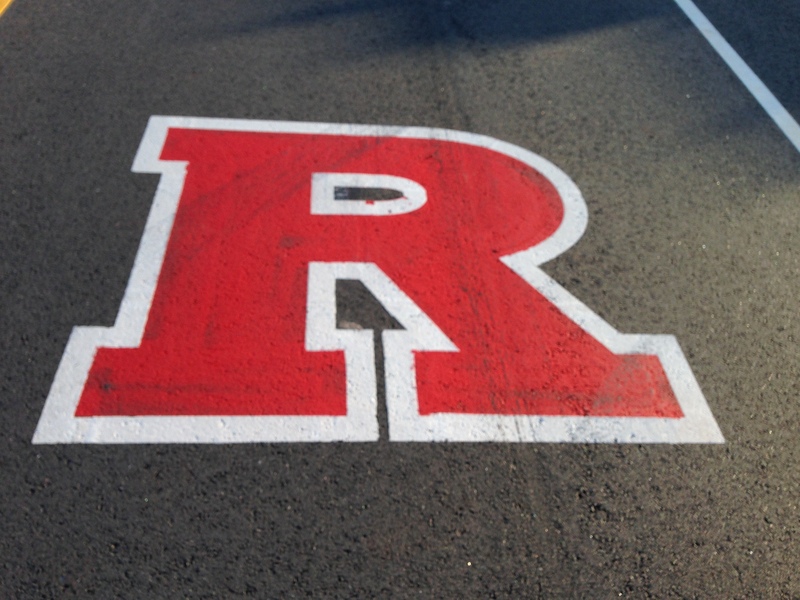 I didn’t know at the time that it was Rutgers Open House weekend. The weather was beautiful and it was an easy drive for the most part. It took me under an hour to get to the campus but once upon arriving it took me almost 20 minutes to get into the parking area for packet pickup. 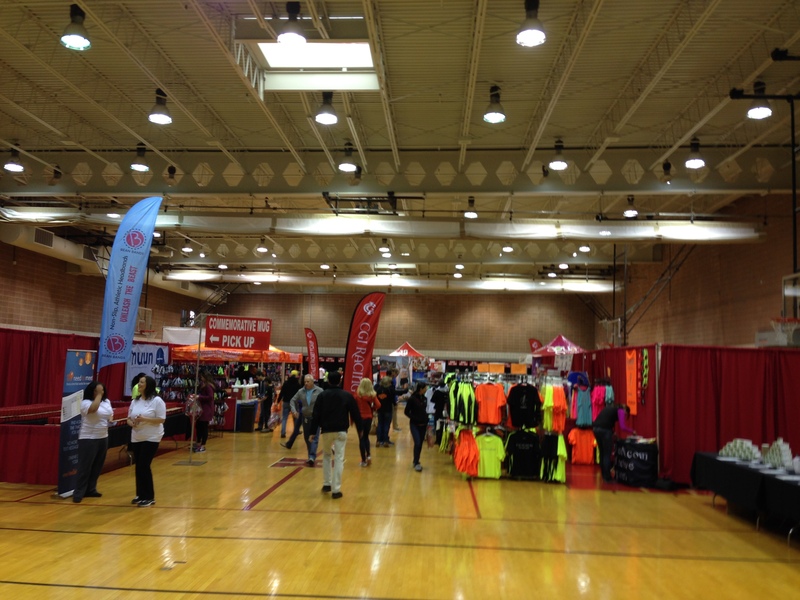 The packet pickup was at the Sonny Werblin Recreation Center. It was a busy morning there. There were swim meets going on, there were other sports being played so there was a quite the foot traffic inside. The expo however was well signed and separate from all the general hubbub outside. The expo itself was held inside a large gymnasium. It wasn’t huge but it was set up clearly. As you entered there was a small area for a speaker series and next to that a desk to look up your race number if you didn’t already have it with you. 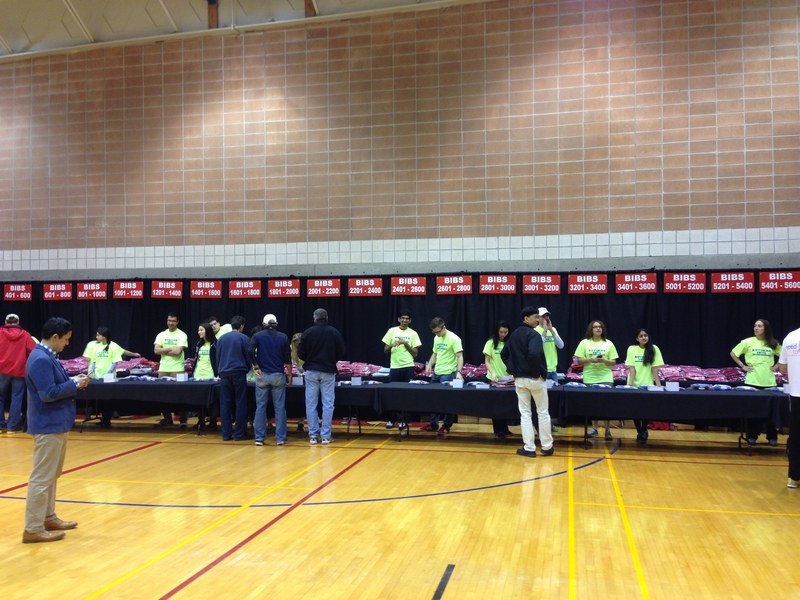 Then at the far end of the hall was the bib pick up and next to that the shirt pick up. There weren’t too many vendors displaying. The National Running Center was there for any last-minute purchases as well as a local therapy provider giving back massages. Also, one of the sponsors (Agua Enerviva) and a local fitness equipment dealer. 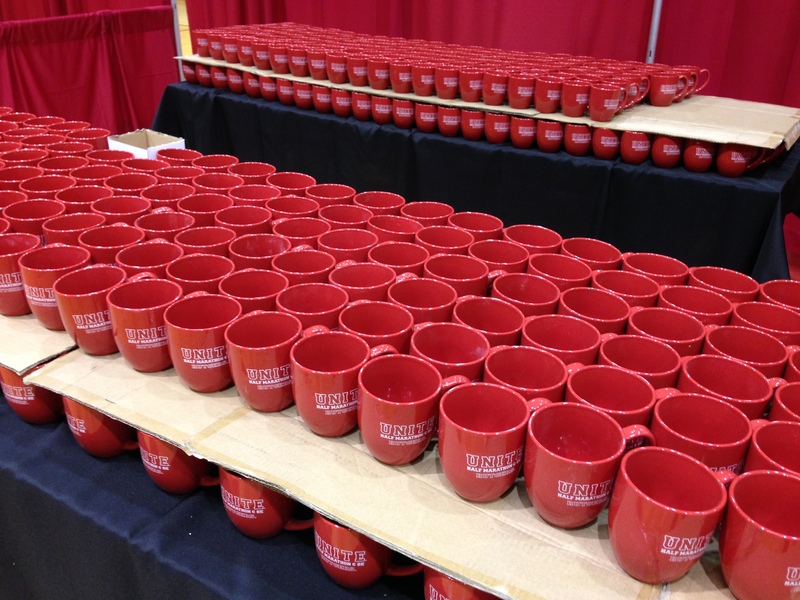 They also had a table to pick up your souvenir mug. 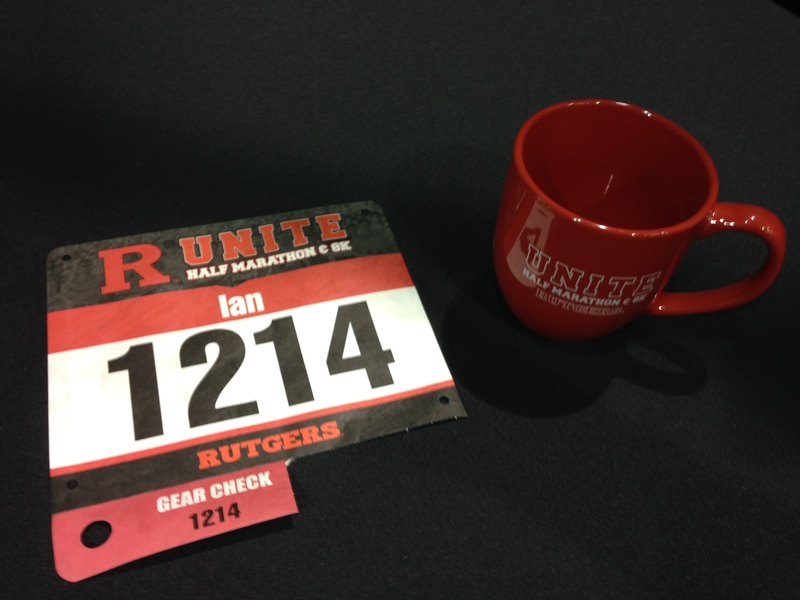 This is quite a nice perk and something I also received when I ran the LOVE Run last year. In hindsight this would have been an ideal race for same day packet pick up. I would highly recommend this option if you are going to sign up for this event. The race itself isn’t small but it isn’t a huge field and there is ample parking at the start line area which is right next to the start line. Also, I met up with John at packet pickup and it was calm and orderly and well run. Race day arrival was very easy. The drive, the parking on campus and the whole traffic flow was a breeze. 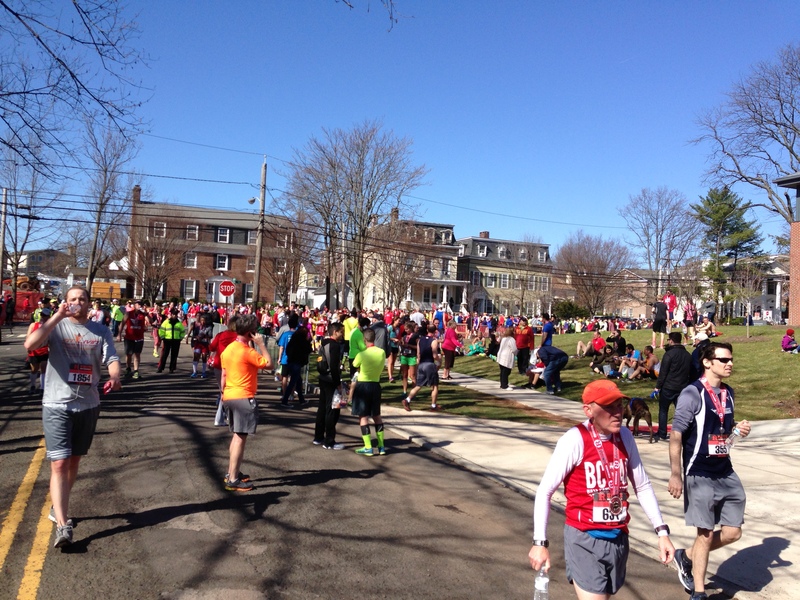 I arrived with plenty of time before the start of the race to stretch, use the port-a-potties and loosen up. I headed down to the packet pick up area to meet John before the start of the race. I always like to meet up with people I know before a race as just chatting with and hanging out with people helps calm the nerves and just generally lifts my spirits before a race. It was a little chilly at the start but I knew it was going to warm up based on the forecast. The sky was clear and the sun was out. 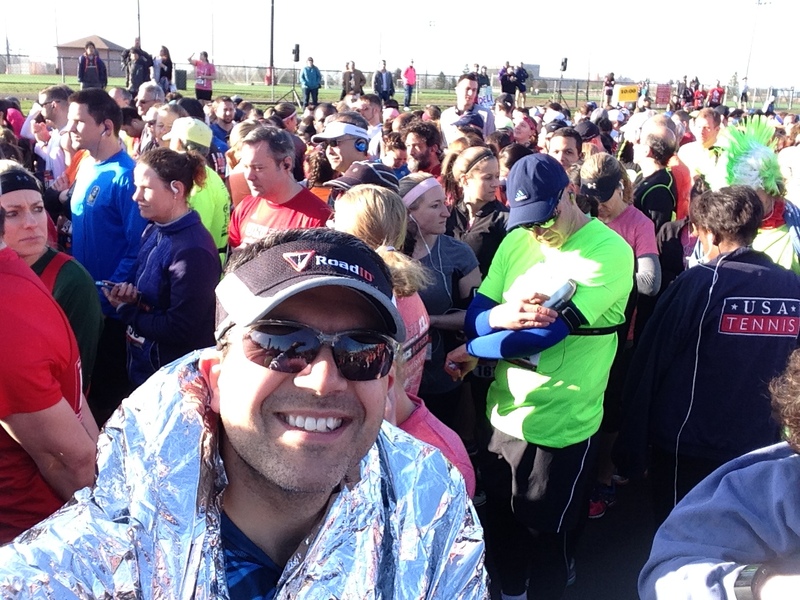 I pulled a mylar blanket out of my check bag to wear while waiting in the corral with a plan to throw it out just before crossing the start line (TIP – if you have mylar blankets handed to you at a race keep them for future races so you can stay warm in the corral of another race). I walked to the corrals with John and we noted that the corrals were set up by pace per mile not any designated letter. 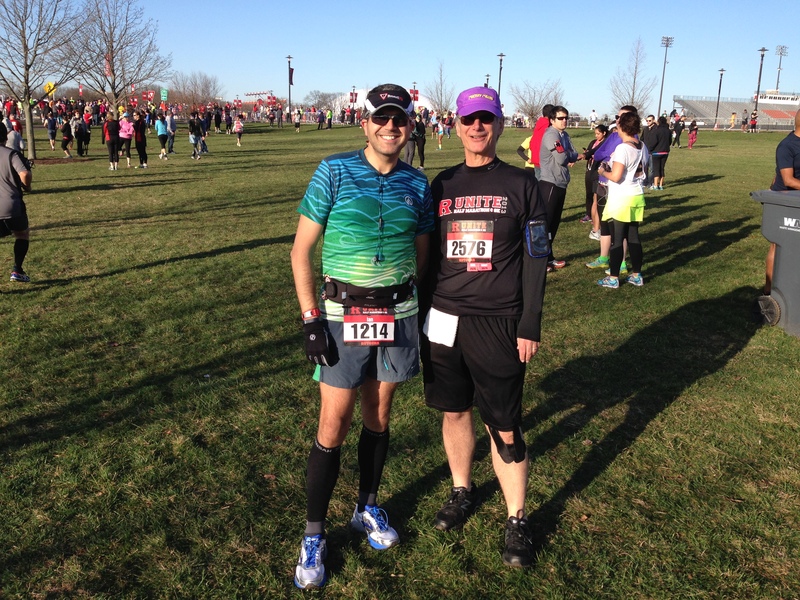 I left John at his prefered pace and I moved up towards the 8:00-9:00 pace area. I didn’t notice any side entrances for the corrals so I had to move slowly through the crowd (politely I may add) to get to where I was going. Once there I settled in and waited for the National Anthem and the starting signal. The start was about 5 minutes delayed but the crowd seemed to be cheery enough. After all, this was some of the best weather we had experienced here in a long time!!! 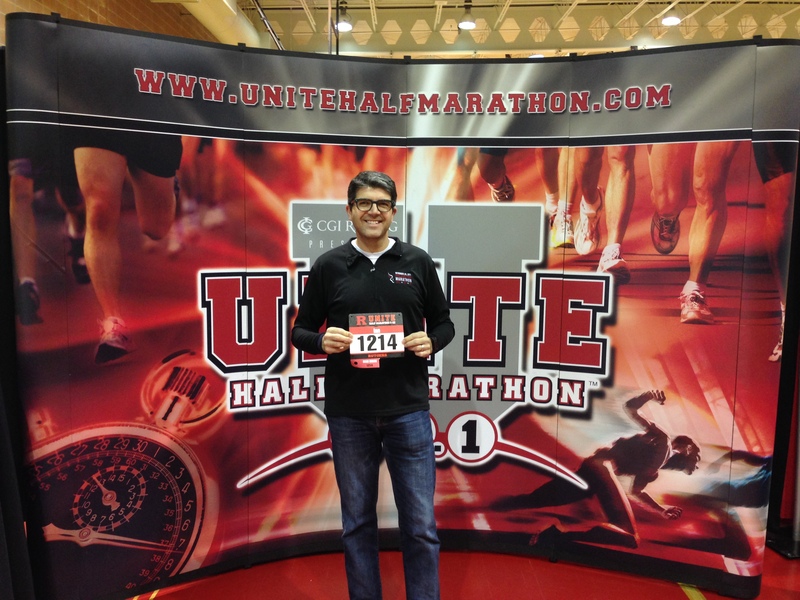 My goal for this race was to see what I had in me after a long winter of running indoors. I recently have been struggling with injury. I tweaked my back and pelvis shovelling snow during the last couple of snow storms we had. As a result of the injury I had taken a full week off from running. If you know me that is a big deal. I was also on antibiotics for chest infection and back on Ventolin for my asthma (for the first time in three years). 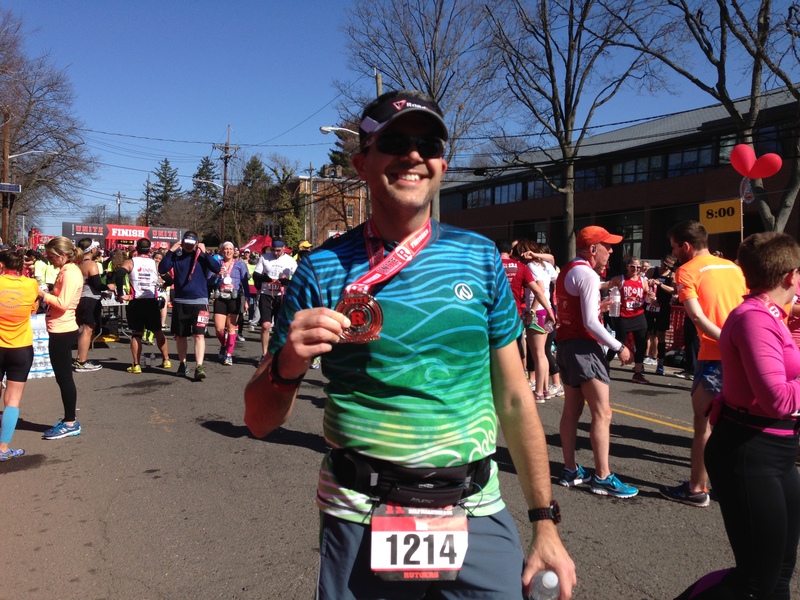 Also, with the upcoming Pittsburgh Marathon I wanted to try out some gear in race conditions. I have recently been experimenting with Injinji running socks and although I had already run some longer distances in them I was playing around with the thickness options they have (original weight vs medium weight). My goal therefore was to see if I could comfortably be under 2 hours. With a time goal in mind I didn’t get a chance to take too many pictures on route. 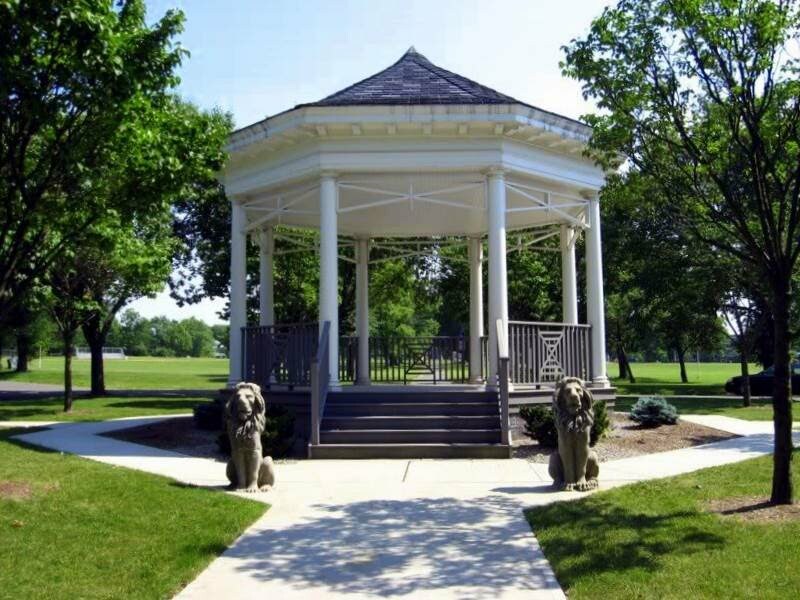 The course itself takes you around the Livingston Campus and Busch Campus for the first 9 miles before you cross over the bridge to Johnson Park and then finally through to the finish along College Avenue. It is not flat and fast as was advertised as there were a number of turns involved on the course and some gently rolling hills but nothing that would lend me to say this was a hilly course. There were plenty of water stations on the course but very sparse spectators, although it should be remarked that this was very early on a Sunday morning on a college campus so I cannot imagine how many students would really be up early. The weather was fantastic and really made for a relaxing run. It actually felt like I was out for a simple weekend long run. The race wasn’t too large so as a runner you had plenty of space to move around and although the streets were a little narrow in places you never felt jammed in. The first few miles ticked away and everyone just set into their own pace. I had started out with the 9:00 minute pace group but soon passed their leader and headed out for my own race. Having never been to college here it was nice to see the campus. I was impressed by the amount of space that there was and that the campus looked pretty well looked after. The roads were a little cut up but I think that was a result of the harsh winter we had and the toll it took on the roadways. You had to be a little careful with footing in some places. Around mile 7-8 we started heading back towards the start line area and in fact headed back up the starting chute for the second part of the race. It was around here that we started experiencing the first of many of the turn arounds. I hadn’t really studied the course map too much and you can never really tell the detail from a picture but from mile 9 onwards there were four hairpin turnarounds. I’m not usually a big fan of turnarounds but based upon the need to squeeze 13 miles into their campus I understand what needs to be done. I settled into a pretty good rhythm and was really enjoying the scenery of the campus and also the park when we crossed over the bridge. Once we entered into the park we stayed along the pathway and ran from one hairpin turnaround to the other. That was probably the least enjoyable part (but still enjoyable race) and we saw a few more spectators on that side of the course as other people were getting along with their own activities in the park at that time of the morning. Heading towards mile 12 all I could see ahead of me was a hill. Uh oh I thought. I was just beginning to feel a little tired at that point. Before the hill however we had to turn right into Buccleuch Park for what turned out to be the final turnaround of the race. At least this wasn’t a hairpin as we got to run around a little gazebo. Once out of the park we had to tackle that hill I had seen confronting us as we entered. To my surprise it had just been a trick of the eye. Yes, there was a an uphill to run but it was short and not as steep as it looked and once you hit the crown you could see pretty much all the way down College Avenue to the finish line. The run down College Avenue was so nice. It is a natural chute funneling you to the finish. Crowds were lined on both sides of the street and they were cheering you along. The downhill wasn’t to steep and allowed you to just glide through the finish. I felt great at that point. I was running around 8:33 pace which was the best I had achieved in a while and I felt comfortable doing it. I crossed the finish line with a time of 1:53:49. Well under two hours and within a couple of minutes of my half marathon PR. I was very pleased with the result. I crossed the finish line and received my medal and also was handed a bottle of water. It had warmed up quite a bit at this point. Not too hot but was just a beautiful day. By the way, my choice of outfit was my new INKnBURN Flow shirt. I think it was a perfect choice and very comfortable for the conditions. This has become my favorite shirt recently. 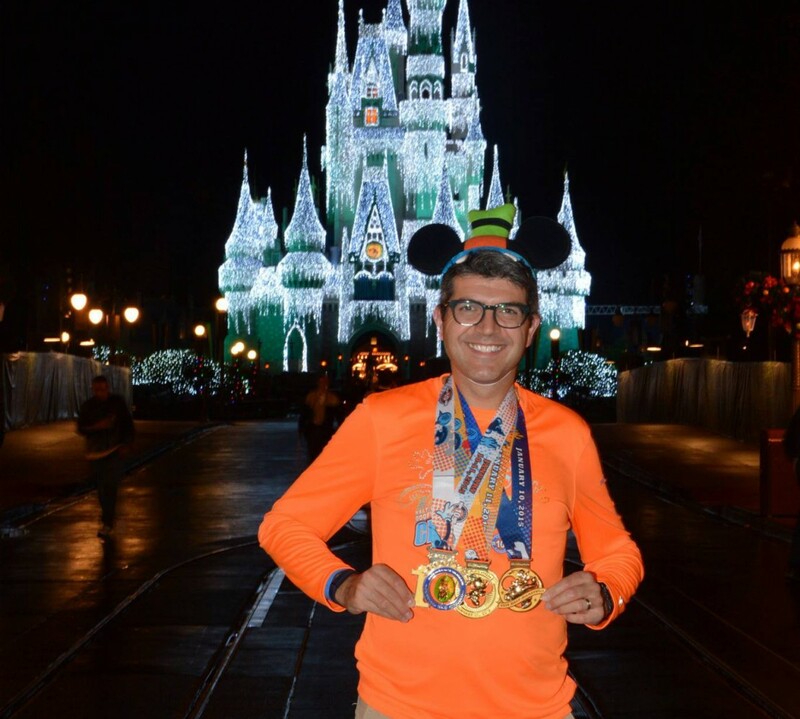 I had been trying to decide between this shirt and my Mickey Milers shirt (as I was meeting up with fellow Miler John) but went with this combo. The socks worked out great too. I would recommend trying a pair if you get the chance. A little weird to look at and to put on but if you are prone to blisters these offer great protection. After coming through the finish line chute we turned left to the post race area. 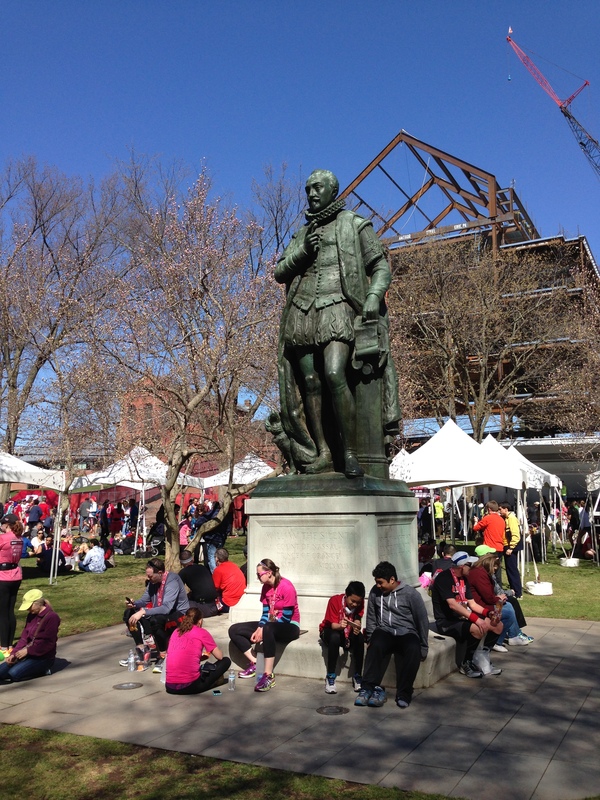 The campus was ideal for a post race area as the streets were wide, the crowds were separated to the family reunion area and there was a lot of green space to stretch out and relax. 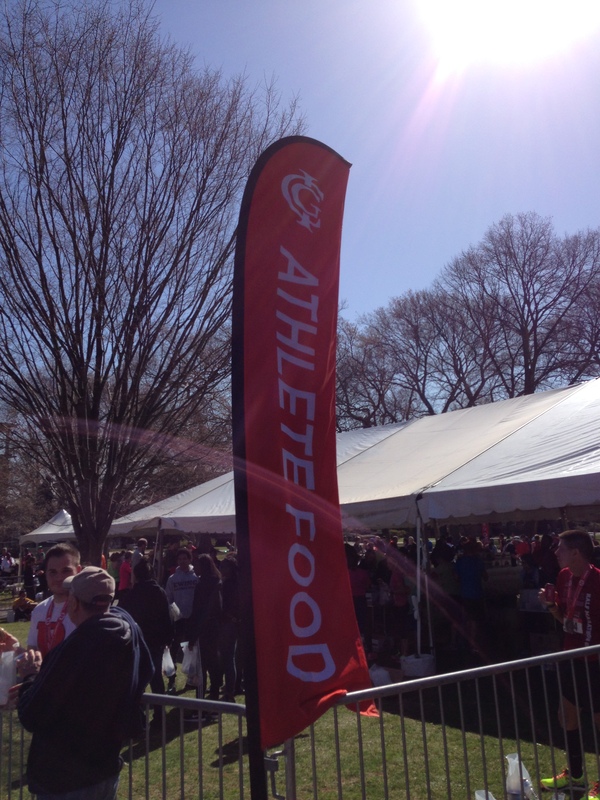 The food tent was labeled clearly for runners only and they checked your bib to go through. I was very grateful for the soft pretzel. What I didn’t see was any sports drink to replenish any lost electrolytes. That was probably my only complaint. The medal was a decent size but a little ‘lightweight’ and a little plain. Also, on the medal and on the ribbon it said ‘Half Marathon and 8K’. I wasn’t sure if this was the same medal handed to people who ran the 8K also. That seemed a little strange that these wouldn’t be unique to the race. Overall though I would totally recommend this race. Timing was perfect, we lucked out with the weather, the course was enjoyable and the size of the field made it feel like a big race without being a big race (i.e. plenty of room to move about). I would recommend that if you register for this race (and you should if you are nearby) you opt for race day packet pick up as the expo wasn’t a compelling reason to go twice in two days. John and I spoke about this race on his podcast. Here is the link to the episode (Episode 35 – It’s A Beautiful Morning Edition’). 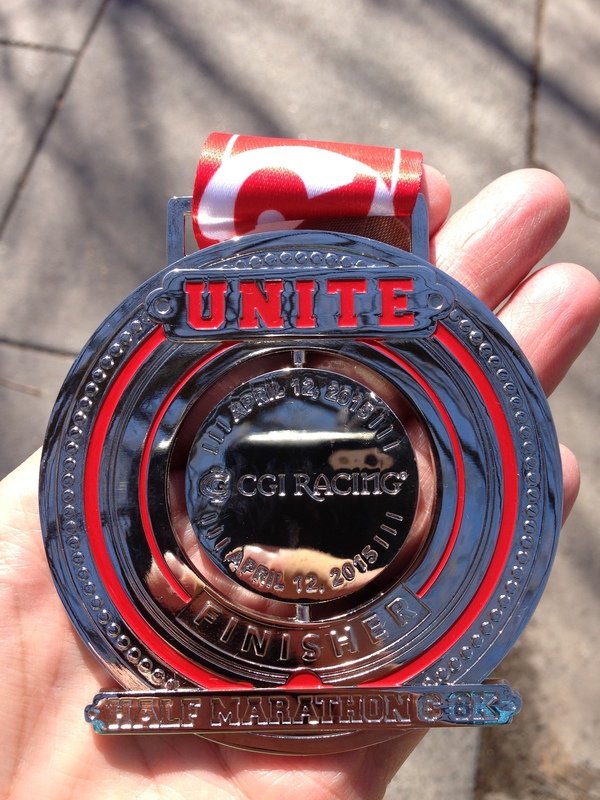 I did this race last year and I loved, loved, loved the pretzel at the end. 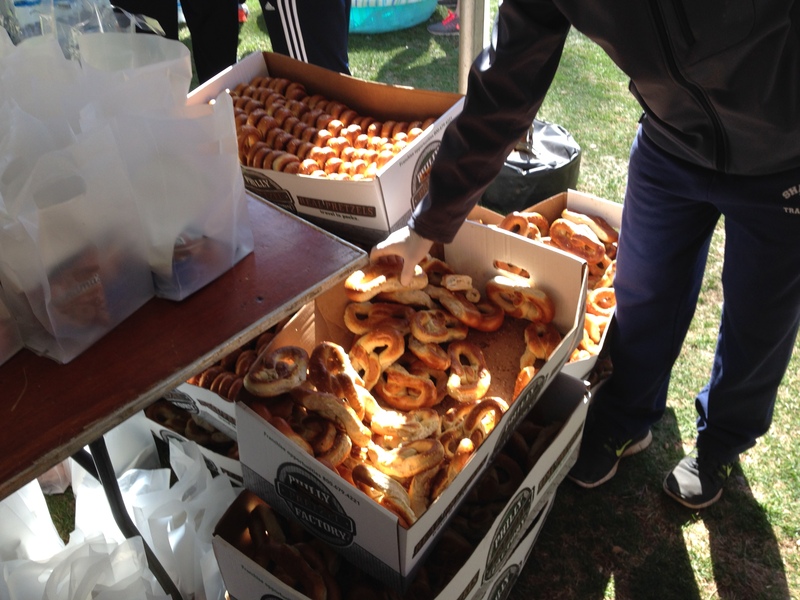 If only every race had soft pretzels at the finish!